Never let it be said that The Chronicle shied away from Russo-Japanese War coverage. 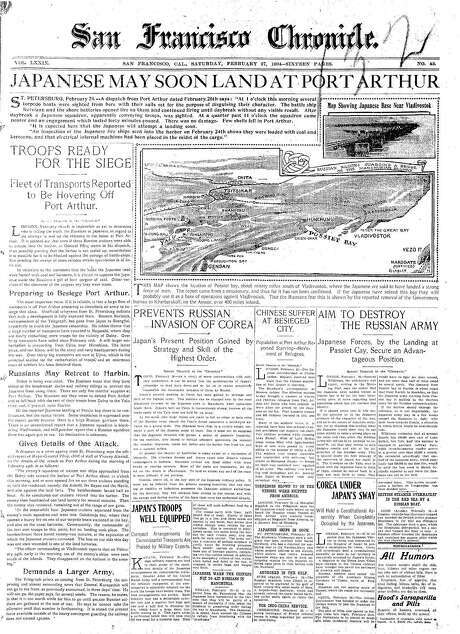 The front page from Feb. 27, 1904, covers the Battle of Port Arthur a few weeks after a surprise attack by a Japanese fleet on Russian ships. It was the beginning of a war that would last 18 months and end with a victory for Japan that drastically changed the country’s standing on the global stage. Tensions were high along the Liaodong Peninsula in China when this page was published. It would take more than a month, but the Siege of Port Arthur would begin in April 1904. By the end of the year, all of Russia’s Pacific fleet battleships would be sunk. Six months later, Japan would have victory. All-out war coverage: This front page features 12 stories devoted to the conflict, in addition to a striking map and a handful of other headlines on the page. Now that’s comprehensive coverage.